Motor sailer, built in 1957 in the Swedish boatyard of Ivar William in Motala. Oak frame construction sheathed in mahogany with teak decks. Although we keep her in France, she is Registered in the UK: SSR 83882. 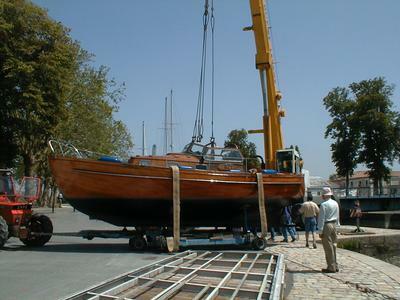 Bought in 1998 for the equivalent of 14,000 Euros and brought by trailer to France. The boatyard that constructed the boat are still operating under the control of the original family and a link is provided to their website, which is in Swedish but can be translated using one of the internet translation sites. 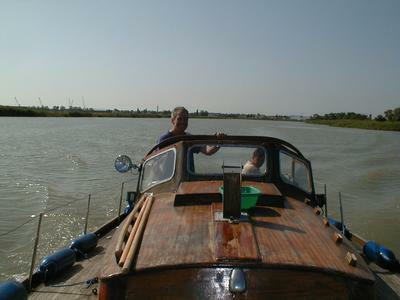 Despite annual maintenance the boat now requires restoration which is beyond the current owner who only spends 2 months of each year in the country. The work required is the replacement (or sistering) of several supporting ribs and replacement of some of the mahogany surrounding the deck and seating areas. The engine, a Volvo Penta MB20 is in excellent order having been serviced annually and benefiting from a recent replacement of the alternator, starter motor and the carburettor. This is not the original engine and was probably fitted in the late 60`s. The power output is 53hp and this engine is a detuned marine version of the engine fitted to the Volvo 120 series cars on which Volvo`s reputation was born. Included in the sale are 2 Anchors, Lines, Fenders, Cushions, Chemical Toilet, Fridge, Pulpit and Guard Rails, Compass, Tiller and numerous other parts and spares. The steerable launching trolley/trailer was purpose built by a local artisan for launching and retrieving the boat from the river and transport around the quay. Additional photos can be taken on request. The price to include the boat, all accessories, trailer, documentation and storage until March 2015. The price reflects the need for ongoing restoration work. 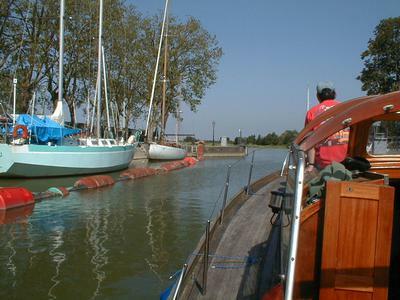 7500 euro negotiable but may also be subject to adjustment to include any additional repair works carried out. I got a resuration project going on a the moment,a boat without any form of ID, no reg papers, only boat yard in Motala marina number from 1957. I was on the wrong track finding information, I'd presumed the boat was a day cruiser, while removing the deck covering I came across the filled in mast accses hole, the mast foot is compleatly missing. 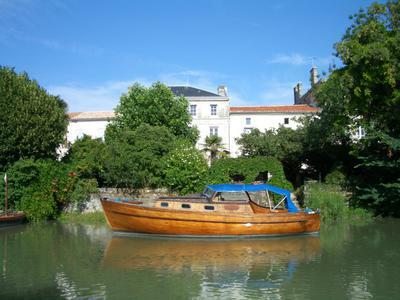 I changed my search and came accross your boat that has the proportions, have you any more pictures(my boat is in the picture gallerie). I tried the boatyard but got no replys,maybe you could help fill in a few missing pieces to my identification problem.